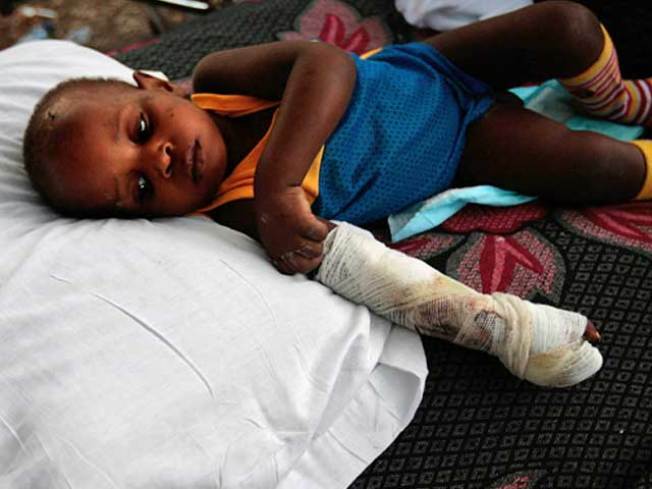 Nearly a week after the Haiti earthquake, an overflow of patients and ongoing shortage of antibiotics often means doctors have few options other than amputation to save a life, says NBC's Dr. Nancy Snyderman. Nearly a week after the devastating earthquake, victims who sustained crush injuries and broken limbs are now suffering from rampant secondary infections. Faced with an overflow of patients and an ongoing shortage of antibiotics, medical teams have few options for saving lives. Amputation is increasingly the only resort, says NBC's Dr. Nancy Synderman, who has been helping to treat patients in Port-au-Prince. She spoke with msnbc.com about the rush to save lives at a small private hospital in Port-au-Prince. What is the main concern of medical teams treating quake victims now? Increasingly, it’s been amputate or die. Secondary infections are huge. It’s the No. 1 cause of death right now. We’ve not yet seen cholera or dysentery. We’re seeing so many people with crush injuries and open wounds. And because there isn’t the time or the antibiotics to save an infected arm like you might have back home, the decision is, if you can amputate an arm, you can save a life. We’ve been at Sacré Coeur, a small private hospital that has been turned into a trauma center. On Monday, they estimated they were going to amputate the arms or legs of up to 70 people. Whether it’s babies or the middle-aged, they are tagging people for these operations right and left. Because so many Haitians don’t have medical records, a doctor we followed, Dr. Julie Manley from Raleigh, N.C., was walking around with a pad of paper and writing down what patients needed and taping it to their chest. We watched a young girl, probably about 5, with a severe injury to her right leg. Dr. Manley said to her mother, she needs to have her right leg amputated and the mother said, no, that she would rather that she die. The little girl could hear the interpretation about her leg in French and she started crying with great anguish, "mama, mama, mama." The doctor had to instruct the mom to hold her daughter’s hand and not leave her. I don't know what happened to that little girl. In a country where survival is so tough, for an amputee, it’s nearly impossible. Its raises the question of what’s going to happen? There are no prosthetics for a country that may soon be a country of orphans and amputees. I saw babies whose skulls had been cracked open like watermelons. The best doctors could do is put a wrap around their heads and cover them and leave them to die. The job right now is to treat the minimally wounded and get them on their way so they don’t take up valuable space. Doctors have to take the people who are dying and humanely put them on the periphery and cover them to keep the flies off. Then you have to take care of those people where you think you can make a difference. Many non-governmental organizations, including Doctors without Borders, have said they’re 24 hours from running out of supplies. The private hospital Sacré Coeur said they’re holding on by the skin of their teeth. What has most surprised you about the medical situation? I would have thought that a week after the earthquake that the triage part would have been over. If anything, what we’re seeing is an escalation of injuries because people who didn’t die right away and were in shock for the first days, either didn’t or couldn’t make it to a hospital. Now they’re wandering in. What are the critical issues over the next few days? Getting the infection rate down. Its still going to be about amputations for the next two or three days. They desperately need orthopedic surgeons and nurses. There are not enough doctors to fix bones. There’s a real nursing shortage. I’m a surgeon but I don’t know how to fix a complicated arm fracture other than put it in cardboard and stabilize it. That’s what I’ve been doing for the past 72 hours. Doctors and nurses are charging forward with big hearts and very busy hands. They are all worn out. A doctor I spoke to worked 23 hours and then snuck out to the courtyard to sleep with the ill and dying. I don’t think there is a break in sight for the medical volunteers. The doctors are very careful to say that the Haitian physicians who were first on the scene did extraordinary jobs and the best they could. When I first arrived on Saturday I didn’t see any Haitian doctors, but that’s because they had been working four days with no rest. The other doctors had sent them home so they could get some rest. I had asked one of the Haitian physicians, do you feel like foreign doctors have come into your country and pushed you aside? He said, no, not at all, medicine is a universal language. Then, the challenge will be rebuilding orphanages for all these children left homeless. One of the saddest images I’ve seen is a boy, about 14-years-old, leaning against a car with knapsack on his back. He said, “my whole family’s dead, I don’t know where to go.” The sun was setting and he was lost in the world.